No. 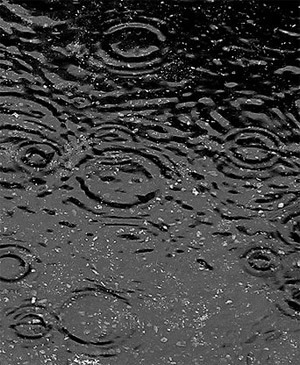 While some cartoons and some science diagrams draw raindrops in that shape, raindrops are neither tear-shaped nor spherical. Due to the interaction of cohesion, surface tension, air resistance and gravity, large raindrops are shaped more like the top half of a hamburger bun. Cohesion is the attraction of water molecules to other water molecules. Cohesion keeps water together, though it cannot hold large amounts of liquid water in a definite shape. Surface tension is the attraction of molecules near the surface towards the interior of the liquid. Surface tension produces the membrane-like, elastic nature of a water surface that allows insects to walk on water. Surface tension contracts the surface of a liquid into the smallest possible area. A sphere has the smallest surface area for any volume, so small drops (and bubbles) tend toward the spherical, all other things being equal. But as the force of gravity causes drops to fall, air resistance flattens their bottoms, as you can see by tossing a large water balloon into the air. The combination of cohesion, surface tension, air resistance and gravity gives raindrops that top-of-a-hamburger-bun shape. And why do cartoonists draw rain tear shaped? Because that shape suggests to us that the drops are falling!